The Janus kinase/signal transducers and activators of transcription (JAK/STAT) pathwayis a chain of interactions between proteins in a cell, and is involved in processes such as immunity, cell division, cell death and tumour formation. The pathway communicates information from chemical signals outside of a cell to the cell nucleus, resulting in the activation of genes through a process called transcription. There are three key parts of JAK-STAT signalling: Janus kinases (JAKs), Signal Transducer and Activator of Transcription proteins (STATs), and receptors (which bind the chemical signals). 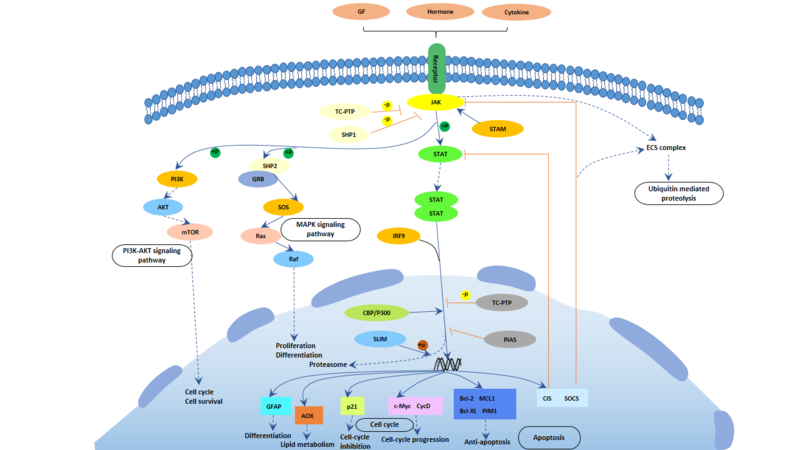 In mammals, the JAK/STAT pathway is the principal signaling mechanism for a wide array of cytokines and growth factors. Following the binding of cytokines to their cognate receptor, STATs are activated by members of the JAK family of tyrosine kinases. Once activated, they dimerize and translocate to the nucleus and modulate the expression of target genes. In addition to the activation of STATs, JAKs mediate the recruitment of other molecules such as the MAP kinases, PI3 kinase etc. These molecules process downstream signals via the Ras-Raf-MAP kinase and PI3 kinase pathways which results in the activation of additional transcription factors.